Loudons has to be the best destination cafe for a coeliac in need of cake in Edinburgh. Wow! This is a long review, but stick with me, as I think you will be pleased to know about Loudons …. From the moment I walked in the door and saw a RANGE of gluten free goodies, all safely protected from contamination under glass domes, I felt this was going to be good. Loudons is on Fountainbridge, which is largely an office area and not close to town or to any residential districts so I half thought that it would be closed on a Saturday lunchtime. Instead I was amazed to find it packed to the doors! Clearly it has a reputation that draws keen foodies wanting a delicious lunch in nice surroundings. The menu is extremely clear, with a brilliant range of gluten free options. I was dining with friends, one of whom is gluten and dairy free – and the menu was also clear for him. There is no need to a special menu as this place just embraces our GF lives with panache. 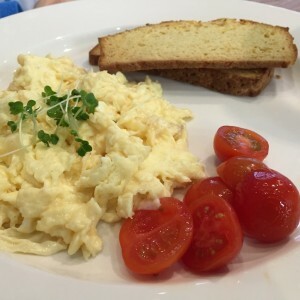 Once we had a table we chose light lunches: I had the gluten free broccoli quiche with rocket and fennel salad; and my friends had the cooked breakfast (the full works + delicious homemade baked beans) and scrambled egg with gluten free bread. The bread was terrific. It has the consistency of a scone, but is tasty and light, with a seedy, possibly cheese crust and is probably best described as being like a cornbread. And things just got better when I saw that we could buy a small loaf to take home for Sunday breakfast! The quiche was light and filling at the same time, with good flavour, really green broccoli, plus good shortcrust pastry that had a bite and no grittiness. The cooked breakfast got an OK from my friend (not brilliant, but fine), and the scrambled egg with GF bread got a positive thumbs up. We then moved onto cakes… We chose three to try: orange, polenta and almond (gluten + dairy free); raspberry and lemon (gluten free); and coffee and walnut (also gluten free). Raspberry and Lemon had a zingy bit of raspberry in it, light, moist sponge and delicious raspberry cream filling – this was my favourite. Coffee and Walnut was possibly a little dry and needed more filling, but was tasty and generous. While Loudons is not in any of the areas of town I am usually in, this is sufficiently good to make it a destination for breakfast or lunch. I may even try to arrange meetings with people who work nearby, just so I can go. I shall certainly buy the takeaway loaf of bread, and really just highly recommend it all round. A complete joy!